Standing inside a historic seven-story downtown warehouse undergoing a major renovation as a space for tech startups in Kansas City, Mo., Herb Sih talks about fostering "collision density" in the nation's heartland. Sih, managing partner of tech incubator Think Big Partners, hopes the renovation of the 1902 Globe building will help a blossoming community of developers and other tech types in the area collide -- in good ways -- to inspire the creation of new mobile apps, other software and hardware. Behind that more immediate goal is a wish to make the downtown area more livable and attractive to young tech types, artists and businesses. The old Globe building conveniently fronts Main Street, along which a two-mile, $102 million streetcar project is underway, with completion set for mid-2015. From the north, streetcars will pass through downtown skyscrapers and then through both the hip Crossroads Arts District and the restaurants and nightlife in the Power and Light District, before reaching the 100-year-old Union Station to the south. A two-mile KC Downtown Streetcar line is under construction along Main Street in Kansas City, Mo. It will connect the city's Riverfront neighborhood next to the Missouri River with Union Station to the south, serving an area of accelerator and incubator office spaces for tech startups. Cisco plans a smart city network in the area along the line. Tech providers have lined up, too. In 2012, Google kicked off its first-ever Google Fiber gigabit fiber initiative, first on the Kansas and then the Missouri sides of Kansas City. That innovation sparked a flurry of unprecedented tech activity that feeds off the region's long history in medical technology and wireless networking, headed by area companies such as Cerner and Sprint. In May, Cisco said it will bring wireless smart-city technology to the downtown, too, in an area that coincides with part of the streetcar project. These services will include mobile apps for citizen access, digital interactive kiosks, smart streetlights and video surveillance. Sih's "collision density" reference has been used in other cities birthing tech incubators and accelerators, such as Las Vegas, Washington, D.C., Cambridge, Mass. and Pasadena, Calif. The term seems especially apt for what government and business leaders hope, both for Kansas City, Mo., and adjoining Kansas City, Kansas. 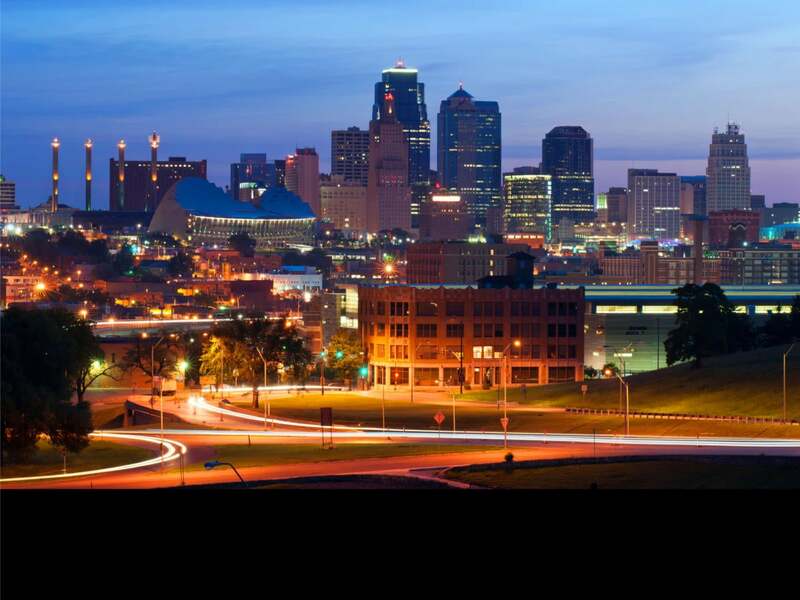 In all, the region has about 2 million residents, with Kansas City, Mo., by far the largest city with 465,000 residents. "Collision density" was borrowed from physics, but city planners have turned it into a buzzword that means bringing together a critical mass of software developers, computer engineers, designers and concept teams to ignite and nurse creative projects. Sih says he first heard the concept in reference to an ongoing project in the older downtown Las Vegas area that has been fostered by Zappos CEO Tony Hsieh. "He said you need [enough] people per acre to live, work and play together, clustering and colliding with each other," Sih says during a recent tour of the Globe warehouse project. The various partners in the Globe renovation are building a number of workspaces on different floors, including small office spaces that can be rented short-term and restaurant booth-like spaces that can be used for just an hour at a time. 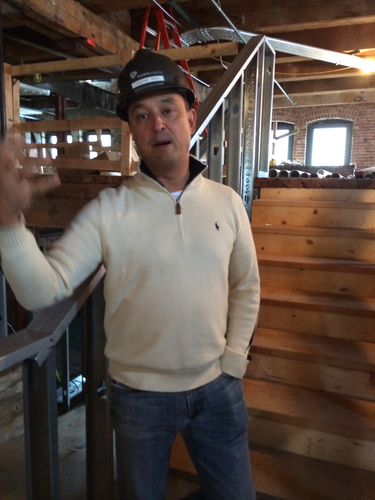 Inside the historic Globe warehouse construction on Main Street of Kansas City, Mo., Herb Sih of tech incubator Think Big Partners shows off an unfinished open stairway where developers can stand and pitch tech ideas to colleagues and strangers in a free-form sharing process. Cisco plans to have offices inside the renovated building, which will be equipped with wireless beacons for devices connected to the Internet of Things. The beacons, from a Boston company called Robin, will use Bluetooth Low Energy and iBeacon technology to connect to smartphones and smartwatches. The beacons can be used to turn on lights and open doors and may even track movements of workers to coordinate better "collisions" among different work groups, Sih explains. The setup might, say, help a newcomer find another newcomer or someone there a little longer with a similar interest. While standing on one central staircase under construction in the warehouse, Sih pauses to show how he hopes it will become a kind of impromptu tech pulpit for preaching the virtues of a new product, offering help to other developers or even for asking for assistance. "It can be a soapbox for the town crier to address informal gatherings," he says. Sih's collision density ideas are already being echoed all around the KC region, including at the nearby Sprint Accelerator building a few blocks away from the Globe. Another area is in an older neighborhood of modest homes about 30 blocks south on the Kansas side, where KC Startup Village (KCSV) got its start in the first-ever Google Fiber connected zone. "It's all about creating energy," says Matthew Marcus, co-leader of KCSV, during a tour on a recent rainy late summer day. Since 2012, more than 20 startups have begun working out of several homes in the neighborhood along State Line Road. Some of the homes needed special-use permits from the city to allow the businesses to operate in the residential area. In a residential neighborhood in Kansas City, Kansas, along the state line with Missouri, a group of coders and tech innovators have created Kansas City Startup Village (KCSV). The small, home-based offices are connected to ultra-fast Google Fiber and more than 20 startups have worked there. Matthew Marcus, co-leader of KCSV, poses near the official red flag for the budding community. One developer of a search engine called Leap.It recently finished laying down a new ceramic tile floor inside the bungalow that doubles as his office. "We do it all," says the developer/tiler, Tyler VanWinkle. The common theme for Leap.It and other startups in the KCSV: Low rent and access to fast Google Fiber connections, often ranging from 850Mbps to 900Mbps, both upstream and downstream. Back in the downtown Sprint Accelerator building, a large second floor has been converted into open office space with tables and fast Wi-Fi to encourage collaboration among tech startups and enterprising individuals alike. Free community access to the space is available from 9 a.m. to 4 p.m. Monday through Friday. Sprint opened the Accelerator space in early 2014 to move closer to the Crossroads Arts District and the newfound vitality of the downtown. On the first Friday of each month, art galleries in the quarter stay open late and a mini-festival erupts into the streets. This is in stark contrast to Sprint's corporate headquarters in Overland Park, Kan., about 19 miles to the southwest, in an area that has a decidedly suburban vibe with an automobile-focused ethic. The Accelerator building is one example of the way businesses and government agencies are coping with the sprawl that the overall Kansas City area has become. It's been like a Los Angeles of the midwest for decades, with outposts of growth well outside the urban core. There's an international airport to the north, a spectacularly renovated outdoor sports complex with generous parking for the Chiefs and Royals to the southeast and a major stockcar speedway to the west in Kansas. But while individual areas were humming, it was difficult to generate buzz at the center -- up until now. Sprint has already counted some successes with its downtown Acclerator. Last year, the carrier announced a formal program with startup accelerator Techstars -- which has programs in seven other major cities including London -- that features three months of mentoring for startups in the Accelerator space, with each startup receiving up to $120,000. The first 'graduates,' the class of 2014, included 10 mobile health-related startups. Two of these graduates -- FitBark, which makes an activity tracker for dogs, and Symptom.ly, which makes a mobile monitoring device for humans with asthma and other chronic illnesses -- plan to move to the area permanently. Part of the advantage of this type of open collaboration is "that it doesn't need to be coordinated...You kind of need to let it happen organically," says Kevin McGinnis, vice president of the Sprint Accelerator. Google Fiber says it's already completed over 7,000 miles of construction in the area, mainly in Kansas City, Kan., and the central portion of Kansas City, Mo. Various small businesses and nonprofits are now pushing to find more ways to jump aboard the super-fast 1 Gig connections. Google won't say how many household customers it has in the area, but government officials say the fiber service already passes along streets that count 200,000 homes in both states. Carlos Casas, Google Fiber sales and strategy manager, admits there are sometimes service interruptions, but says customers are thrilled with the fast service that can support six or more video streams simultaneously from one pipe. In a demo at a Google Fiber service center built in a retrofitted gymnasium, Casas was able to demonstrate 849Mbps download speeds and 943Mbps upload speeds. Google in April said it planned to test ultra-fast Internet service to small businesses in Kansas City by the end of the year, but hasn't followed up with any specifics.